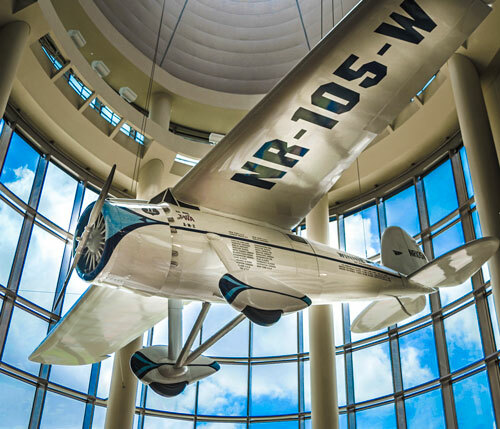 On display in the Devon Great Hall is a replica of Wiley Post’s world-famous Winnie Mae airplane. The Winnie Mae was a seven-passenger Lockheed Vega. In 1931 Wiley Post flew the around the world in a record-setting eight days as pilot of the Winnie Mae. The Cooper and Gladys West Atrium Wing and Gallery features the Oklahoma Family Tree. 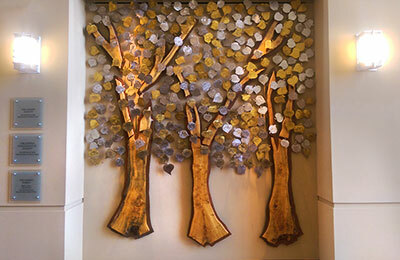 This original sculpture was created by artist Robin Starke and depicts three redbud trees with gold and silver leaves. Each leaf of the Oklahoma Family Tree memorializes an Oklahoma family with the family surname, first name(s), and the town or county in which they lived. A brief family history is preserved in a touchscreen at the base of the tree and on the OHS website. Explore family histories online. Commemorate your family’s name on the Oklahoma Family Tree. The Oklahoma Family Tree is sponsored by the 1889ers Society, the Oklahoma Genealogical Society, and the Mabrey Family.